The Jammin at Hippie Jack's 2019 Spring Music Festival is coming May 23rd-26th! Tent and RV campers with a weekend camping pass can start to roll in on Thursday at 10AM. On Thursday evening there will be a campers' potluck dinner party from 6:00 -7:00pm, followed by the Thursday night headliner, and then the lighting of the bonfire! We're so pumped! Get ready for 3 days packed full of original Americana music, family-friendly activities, workshops, swimming, bonfires, picking, and community. 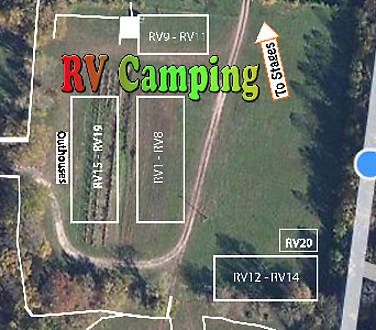 Please select the RV campsite you wish to reserve for the weekend from the map below. The reservation includes (1) campsite and (1) weekend pass. Each ADDITIONAL camper must also purchase a weekend pass or day pass for each day they are camping. RV sites DO NOT have electrical or water hookups. RV1 $150.00 $8.90 SOLD OUT! RV2 $150.00 $8.90 SOLD OUT! RV3 $150.00 $8.90 SOLD OUT! RV5 $150.00 $8.90 SOLD OUT! RV7 $150.00 $8.90 SOLD OUT! RV8 $150.00 $8.90 SOLD OUT! RV9 $150.00 $8.90 SOLD OUT! RV10 $150.00 $8.90 SOLD OUT! RV11 $150.00 $8.90 SOLD OUT! RV12 $150.00 $8.90 SOLD OUT! RV13 $150.00 $8.90 SOLD OUT! RV14 $150.00 $8.90 SOLD OUT! RV15 $150.00 $8.90 SOLD OUT! RV16 $150.00 $8.90 SOLD OUT! RV18 $150.00 $8.90 SOLD OUT! RV19 $150.00 $8.90 SOLD OUT! RV20 $150.00 $8.90 SOLD OUT!